Access documents from Dropbox directly in Zenkit so you can easily attach files to items. 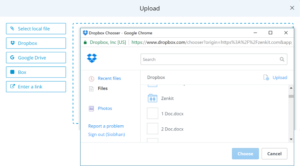 Choose Dropbox from the list of options in the upload popup. Select a file from your Dropbox then click ‘Choose’. Your Dropbox file will appear in the list of attached files on the item.